Tap! The iPhone and iPad Magazine hits newsstands today, offering everything you need to know about iOS4. The magazine has been created by the makers of TechRadar and MacFormat, and is your one-stop shop for app information – offering a guiding light through the myriad applications available on the Apple App Store. 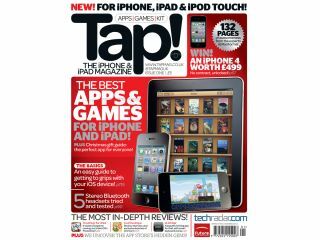 The first issue of Tap! The iPhone and iPad Magazine launches alongside the website www.tapmag.co.uk and you'll be able to easily spot the magazine on the shelves, since it's the one that's exactly the same size as an iPad. The price for Tap! Magazine is £5, and the makers of the mag want to know your opinions, so get onto Twitter and follow @tapmaguk and have your say using the hashtag #tap1. Pricing for the digital edition for the iPad and the iPhone app are to be announced, but it will be on sale shortly through Zinio. You can also subscribe to the magazine by going to www.myfavouritemagazines.co.uk/tap.